My visit to New York seems to be a trip meant for tips. As I explained in an iPodBlog entry earlier today, I’m in the Big Apple talking iPods, iTunes, and podcasting at the MacLive learning conference for creative professionals being held the 11th through the 13th at Jacob Javitz Convention Center. This morning I attended a Richard Harrington’s Final Cut Pro boot camp session. It would be unethical for me to reveal any of the many Final Cut secrets he passed along during that session (after all, the man’s got to make a living), but I have no qualms about passing along a presentation technique he used. As you’re aware, Final Cut has a pretty dense interface. When Richard wanted to show off a particular area of the interface, he didn’t—as many presenters do—simply wave his cursor at that area. Instead he invoked a keyboard command that zoomed in on the area around the cursor. He didn’t explain how he did it, but here’s my best guess. Launch System Preferences and click the Universal Access preference. 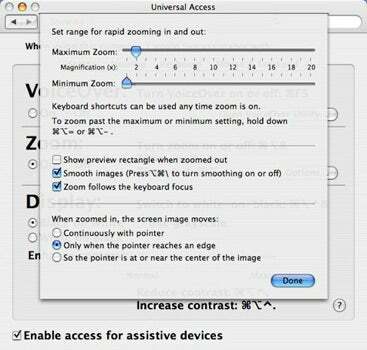 In the Seeing tab, enable the Zoom option and click Options. In the sheet that appears set the Maximum Zoom slider to 2 and leave the Minimum Zoom slider where it is. Enable the Only When the Pointer Reaches an Edge option at the bottom of the sheet and click Done. When you’re ready to highlight something on screen, press Command-Option-equals (the “=” key). The Mac will zoom the screen 2x with the cursor in the middle. To move around the screen, simply drag the cursor to an edge and the screen will scroll in that direction.